Happy Hallo-wheek from Revy! 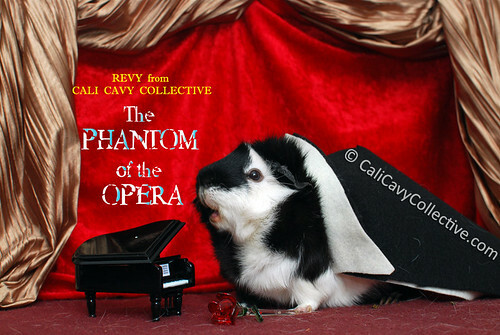 With her built-in mask and bellowing wheek, she decided she would be the perfect Phantom of the Opera. Revy admits she doesn't usually spend her days hanging around onstage and playing (read: chewing) the piano, but she does enjoy lounging in cozies. She's willing to settle for being called the Phantom of the Pigloo.. as long as she gets something green to eat. Hey Alice, Could we maybe use this pigture of Revy for our Undercover guinea pig calendar 2014? I just love it! Love that! the built-in mask is perfect.